Skyros! 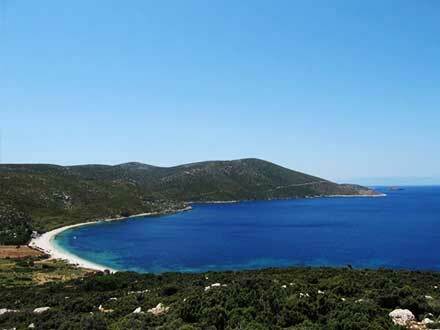 The southernmost island of the Northern Sporades, near the eastern coast of Euboea! Bright and quiet, with beautiful nature and many beaches; famous for its folk art, especially wood art, and the breed of small horses, which live only there. Nice trip, traditional place and options for good and relaxing vacation. In less than two hours by ferry from Kymi of Euboea. 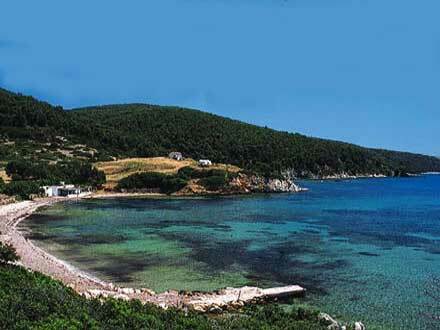 Skyros is located 22 nm northeast of the port of Kymi and the eastern coast of Euboea. It is the southernmost and largest island in the Northern Sporades, with an area of 209 sq km, a length of 28 km and a width of 12 km. Its shape is elongated from northwest to southeast. A large bay in the middle of the western coast, where is the port of Linaria, enters deep in the land, which narrows and divides the island into two parts. The south-east is mountainous and reminds South Euboea and Cyclades. In this it is the highest peak Kochylas at 792m, the Mountain, as the locals call it. Other peaks are the Koumari, the Pyriones and the Fanoftis. The Mountain belongs to the protected areas of the NATURA 2000 network. The northwestern part is full of pine trees, and reminds the other Sporades. In this only one peak, Olympus, is over 400m. The capital Chora is located on the east coast of the north, seeing the Aegean Sea. The coastline has a length of 130 km. In the eastern and northern side there are few bays and the coasts are high and rocky. Large beaches are formed in the middle of the east coast, near Chora. In the western and southwestern side, the coast is lacy with numerous capes, bays, coves and beautiful beaches – more isolated in the north side. Larger are the bays of Kalogria, Pefkos, Aghios Nikolaos and Tristomo. Near the west coast are many islands. Most famous are Skyropoula and Sarakino. Farther, west of Linaria, is Skyropoula or Skyropoulo, with an area of 3.8 sq km, a height of 163m, rocky shores and circular shape with a diameter of 2.5 km. Between that and the coast of Skyros is the islet Renia or Erenia, with a length of 1.7 km, a width of 500m and a height of 22m. In front of Linaria is Valaxa, oblong, with an area of 5 sq km, a length of 5 km, a width of 1.5 km and a height of 219m. North is the rocky islet Koulouri and other smaller islands near the coast and further north the islet Kalogria with a length of 550m and a width of 350m. Opposite the northern cape of Aloni are the islets South and North Podi (Foot). Near the south coast, at the entrance of the bay Three Boukes or Tristomo, are the islet Platy with a length of 1.3 km, a width of 450m and a height of 38m, and the larger islet Sarakino Sarakiniko with an area of 3.5 sq km, a length of 2.7 km, a width of 1 6 km, a height of 131m and the nice beach Glyfada, where small boats go from Linaria. We go to Skyros by ferry or plane. The port, Linaria, is located on the west coast and the airport on the north side. 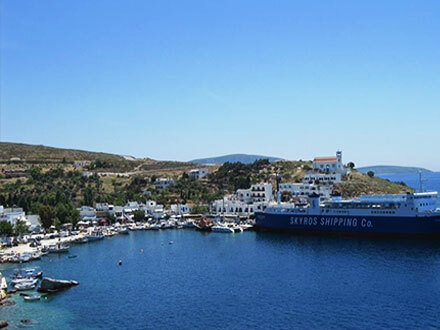 The coastal transport is from the port of Kymi on the east coast of Euboea, with the ship “Achilles” of Skyros Shipping Company, set up by the residents of the island, so the fare is kept at a reasonable level. The trip takes one hour and forty five minutes. 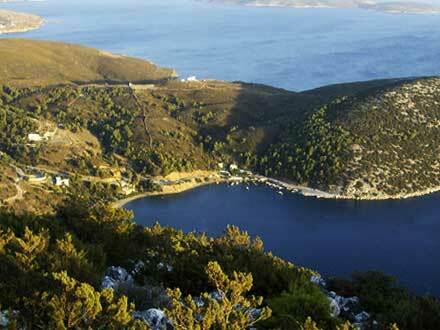 In winter there is a route to and from Skyros every day, while after spring are often two daily routes. The port of Kymi is linked with buses to Chalkis (two hours) and Athens (three hours). The airport is located at a military air base in the area of Trachy, 17 km north of the capital Chora. The transport is by taxi. Three flights during the week to and from Athens and three flights to and from Thessaloniki. In Skyros, bus connects regularly the port Linaria to Chora and its neighboring coastal settlements Magazia and Molos, almost a single residential complex today. Travel agencies organize tours, and there are a few taxis. We can also rent a car, motorbike or small boat. The road network covers most of the island. The main axis is the paved road Linaria – Aspous – Chora (11km). From Chora, a road leads north to the airport, continues west following the coast, reaches the settlement of Atsitsa and from there rediscovers the main road. The settlement of Aspous is linked with Achilli, Kalikri and the bay of Kalamitsa. Another coastal road connects Linaria with Kalamitsa. From there it continues in the southern part of the island reaching the cove Tris (Three) Boukes and after the lighthouse, on the southeastern edge of the island. 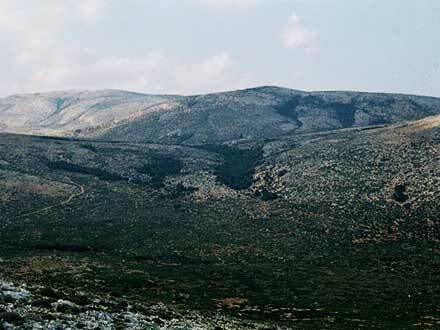 Roads lead to Kochylas, the highest mountain, and the plateau of Ari, a natural habitat for Skyros Ponies. In summer small boats make daily trips from Linaria to the wonderful beach Glyfada, at the islet Sarakino, and in sea caves. 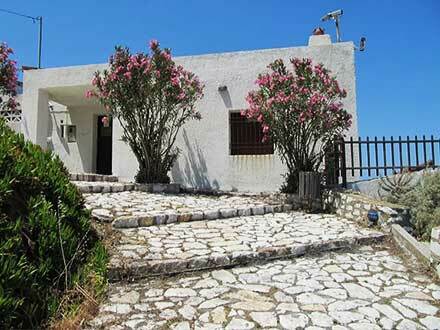 More accommodation facilities – hotels, apartments and rooms – are in Chora and the neighboring coastal areas of Molos, Magazia, Gyrismata, Aspous and Achilli. We can stay also in the port Linaria and in the regions of Kalamitsa, Acherounes, Pefkos, Atsitsa, Aghios Petros, Trachy, Kalikri, Lino, Campos. Restaurants and taverns exist in all these areas, and in other places, such as Pouria and Kyra Panagia. Cafes and bars in Chora, beach bars in Magazia, Molos, Lino and other beaches, coffee bars and ouzeri in Linaria. 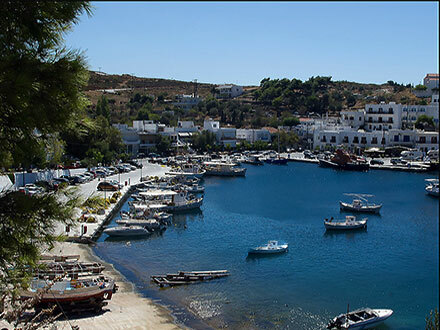 The sea of Skyros is rich in fish, especially on the east coast. Apart from fish, Skyros is known for lobster. Everywhere on the island is served wonderful lobster spaghetti at good prices. Other Skyrian dishes, the local baby goat in the oven, split peas cooked in a clay pot to the ember, the teroptaria (small pies with trachana and rice) and local cheese pies. Well known Skyrian products are honey and cheeses. Famed is the folk art of Skyros (carpentry, wood carving, ceramics, weaving and embroidery). Famous are the Skyrian furniture and textiles. The embroidery is distinguished especially in the decoration of clothes worn at home and the local folk costume. There are workshops and folk art shops (wood carving, pottery, basketry and carpet), mainly in Chora. Skyros was inhabited since the Neolithic era. The first inhabitants of prehistoric times were Carians and Pelasgians, followed by Dolopians. In antiquity the island was called Pelasghia, Dolopia and Isle of Magnets. It is connected with the mythology of Theseus and Achilles. 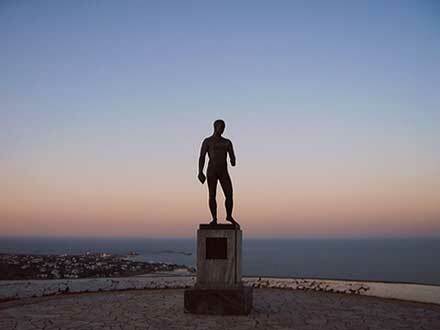 Theseus came to Skyros, when was driven out of Athens. He was hosted by King Lycomedes, who, when he saw that the people admired Theseus, feared for his throne and killed him by pushing him out of a rock in the hill, where Chora is built. Thetis hid in Skyros her son, Achilles, so that he could not go to the war of Troy. She clothed him like a girl and Achilles lived with the name Pyrra among the daughters of the King Lycomedes, and had a son, Neoptolemus, with Diianira. Ulysses came, however, pretending to be a traveling merchant, and the only girl who was interested in weapons was Pyrra. Thus, he discovered Achilles and they left to Troy from the port called today Achilli. According to another tradition, Achilles came to Skyros, and plundered it to avenge the death of Theseus. Dolopians remained rulers of the island until 475 BC, when they were expelled by the Athenians under Kimon. Skyros became a member of the Athenian Alliance. In 404 BC the Spartans arrived and after 340 BC the Macedonians. In 196 BC it was conquered by the Romans, who ceded it to Athens. After the temporary conquest of Constantinople by the Franks in 1204 and the beginning of the Frankish rule in Greece, in 1207, the Venetian Marco Sanudo conquered most of the Cyclades, founding the Duchy of the Aegean based in Naxos. The brothers Andrea and Hieronymus Ghisi conquered the islands of Tenos, Mykonos, Skyros, Skopelos and Skiathos. Andrea became ruler in the two islands of the Cyclades, and Hieronymus in the three islands of the Sporades, which after 1275 returned to the Byzantines. Skyros was one of the islands conquered during the war between Turkey and Venice in 1537 - 1540 by Hayrettin Barbarossa, Admiral of the Ottoman fleet. In 1915, during the First World War, the English poet Rupert Brooke died of disease in a French hospital ship that passed close to the island of Skyros, and was buried in the area of Three Boukes at bay Tristomo on the south coast of island. Skyros maintains its traditions. Most famous, the carnival. Getting started from the port, Linaria, we can make the tour of the northern part of the island by car or bike in less than an hour and a half, if we do not stop. Linaria, in the large bay in the middle of the western coast, is a typical island harbor with taverns, cafes, bars, and beaches from one side to the other. North, in the cove of the bay, is the settlement of Acherounes, with accommodation facilities, restaurants and beautiful beach with sand, pebble and shallow waters. On the other side to the south, a coastal road leads to Kalamitsa, with apartments and rooms to rent and taverns. The beach is preferred by many vacationers. From here we can go to the southern part of the island. From Linaria, the main paved road of Skyros is directed eastward. The first crossway towards the left leads to the bay of Acherounes and two kilometers after another crossway in the bay of Pefkos. In about ten kilometers from the port we reach the other side of the island, the eastern, in the seaside resort of Aspous with sand, accommodation facilities and restaurants. Another road leads near, southeast, in the coastal Achilli. We can also go in Kalikri and Kalamitsa. The main road follows the coast northward and at a crossroads on the one hand leads to Chora and on the other to Magazia. That way, turning right we reach the longest beach on the island and continuing, we find the other beaches on this side from the settlement of Molos to the settlement of Gyrismata. Reaching the east coast, on a bend of the coastal road, we see the hill, where Skyros or Chora, the capital of the island, is built; the Chorio (Village), as it is called by the locals. A beautiful landscape with a medieval castle on top! Chora stretches amphitheatrically, in the north and northwest side of the hill, at an altitude of 90, seeing upwards the castle, to the east the Aegean Sea and low on the shore, the long beach in Molos and Magazia. 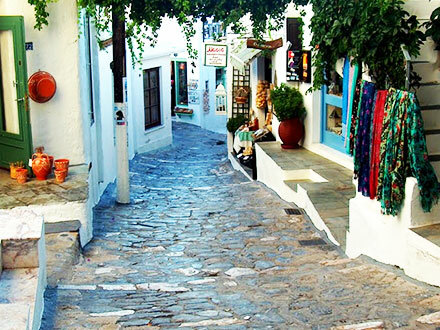 Traditional settlement, it reminds the Cycladic architecture, with its narrow cobbled streets and small white houses. Most shops are in the main street and the central square. From the square the Great Strata, the main road, leads into a crossroads. To the left, we go to the Brook Square, to the right in the Castle. The square of Brook is on the north side. The best time to go there is in the afternoon to enjoy the beautiful sunset and the magnificent sea view. In the square there is a bronze statue in memory of the English poet Rupert Brook, who died at sea in a French hospital ship in 1915, during the First World War, and was buried on the south coast, in the region of Three Boukes. Near the square is the Archaeological Museum with findings from the early Greek to the Roman era. It consists of two ground floor rooms and a covered portico. In the northeastern part of Chora is the Historical and Folk Museum of Manos Faltaits, in an old mansion built on the Palaeopyrgos, the highest tower of the ancient Pelasgian walls of the area. It is one of the first folk museums in Greece, founded by Manos Faltaits in 1964, and includes three folk-historical collections. In the first, the exhibits illustrate the history and traditional culture of the island from the post-Byzantine until the modern era. In the second, three thousand objects and tools present the traditional economy of the Greek area. And in the third, there are rare editions from the 16th century onwards and historical documents from the Byzantine to modern times. Of special interest is the representation of a fully furnished Skyrian house where we see carved chests, textiles, ceramics, traditional costumes, agricultural tools and more. In the castle on the hill, there are ruins of fortifications and the Church of the Assumption, built in 895 and destroyed by an earthquake in the 19th century. At the entrance there is the church of Aghios Athanasius. According to tradition, at the site Andrioti Cave, King Lycomedes knocked down Theseus. 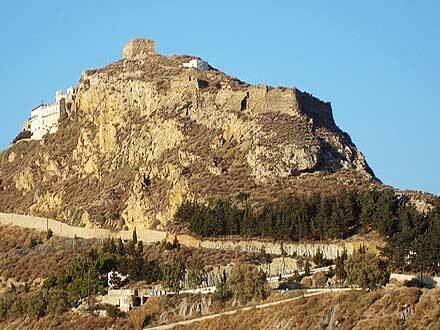 The castle was built in the Byzantine era at the site of the ancient citadel. Near is the monastery of St. George the Skyrian, with the homonymous beautiful church. One legend says that during the era of iconoclasm in Byzantium, the image of St. George came out on the coast of Skyros. In 958, when Nicephorus Phocas campaigned to liberate Crete from the Saracens, the Byzantine fleet stopped at Skyros due to bad weather. Together he was Saint Athanasius of Mount Athos. The emperor promised that if he liberates Crete, will give him a land in Skyros to build a monastery. So it happened. The monastery of St. George was finished in 963. Near Chora are located the coastal settlements of Magazia or Ghialos and of Molos or Skala. Along with Chora, they constitute today almost a single residential complex. A network of roads leads from one to the other side. We can go by bus and on foot from Chora taking the path that starts at the northeastern side, going down at the beginning at the wide steps. It is the most developed tourist area of the island. In Magazia – and then in Molos – lies the largest and most cosmopolitan beach on the island, organized in part with sun beds, umbrellas and water sports facilities. Sandy beach, taverns and beach bars! The coastal road leads further north in Gyrismata, a nice seaside area with a sandy beach one kilometer in length; options also here for stay, food and recreation. Before we get to Gyrismata, we find the site of Pouria on a small peninsula, one of the most spectacular natural areas of the island. The soil consists of soft limestone, and near the sea, carved traces of an ancient quarry can still be seen. In a rock is carved a small chapel dedicated to St. Nicholas; barely for two or three persons. Nearby, a large rock with a narrow base forms a stone mushroom. It is one of the most photographed parts of the island. A small rocky island, with a chapel dedicated to Saint Hermolaus, completes the beautiful scenery. From Chora, the road to the north side of Skyros leads to the airport, but also to beautiful beaches in green environment full of pine trees. At the first crossroads, the road to the right brings us to the east coast, where lies the great beach of Kareflou, isolated and beautiful. Continuing, we reach Trachy, where the airport is situated. One road leads to Palamari, another nice beach, quiet and sandy. In the region, traces of a prehistoric settlement have been discovered. After Trachy, a dirt road goes to the north coast, where there are scenic isolated beaches; most known is the beach of Theotokos. Continuing towards the west coast, we reach the bay of Aghios Petros, one of the most beautiful areas of the island, with fine sand, surrounded by pines and cedars. 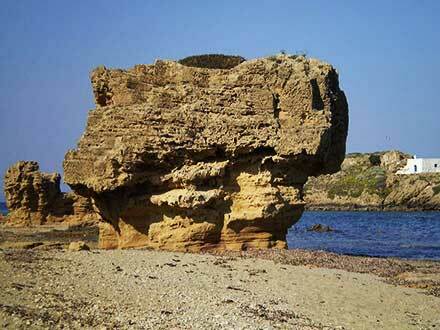 A little further south, we can go walking at the beautiful bay of Agalipa with two beaches, one small and one large. Further south, the road leads to another nice bay full of pine trees. This is Kyra Panagia, with fine sand and shallow waters. It has already been discovered by lovers of camping. Near, in a wonderful landscape, lies the coastal settlement Atsitsa, with rooms to let and taverns. 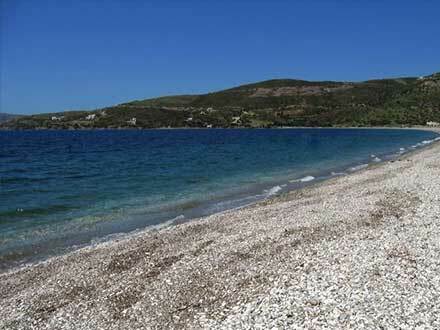 The small beach with pebbles and sand is one of the most beautiful and picturesque of the island. From Atsitsa, the main road is directed inward. A crossway to the right brings us back to the west coast in the bay of Aghios Fokas, with a nice little sandy beach where we can eat. A narrow path leads to another magnificent beach. Returning to the main road towards the south, we ascend a pine-covered hill. If we make a stop in the site Marmaro, where there is a church, we can enjoy the view over the bay of Pefkos, where we go taking the next crossway to the right. It is one of the most picturesque areas, with a nice beach and a small harbor, good shelter for small boats and yachts. 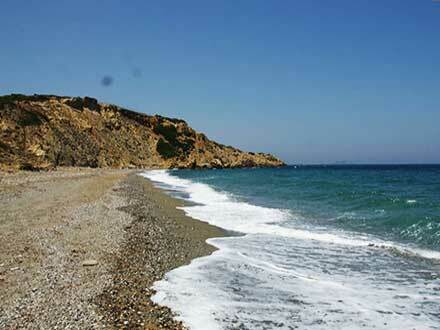 Returning to the main road again, we are close to Acherounes and Linaria, completing the round of the northern Skyros. From Linaria, a coastal road leads to the resort of Kalamitsa. From here we can continue to get to know the southern Skyros, the Mountain, as the locals call the area, dominated by Kochylas, the highest peak of the island. The dirt road follows the west coast to the south leading to more secluded and wild beaches. Most known are the area of Nyfi, and further south the region of Kolymbada, with thick sand and white pebbles. From Kolymbada, we go to the Three Boukes area in the large bay on the southern shore. On the east side is the tomb of the poet Rupert Brook. From Three Boukes, the dirt road is directed east leading to the peak of Fanoftis and to the lighthouse, on the southeastern edge of the island. At the entrance of the bay are the islets Platia and Sarakino. The Sarakino is the largest. 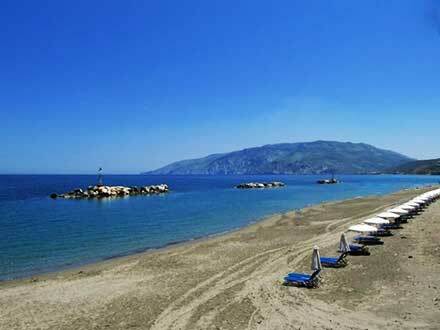 On its south coast, seeing the open sea, the lovely beach of Glyfada is formed, with fine white sand and turquoise waters, where we go by boat from Linaria. The tour is combined with the visit of sea caves, such as Diatrypiti where the boat enters on the one side and comes out on the other. The area of Spelies (Caves) is on the east coast of the island. From the dirt road from Kolybada to Three Boukes and Fanoftis, other dirt roads lead to the mountain Kochylas and the plateau of Ari, where is very likely to see a herd of the famous little horses living in Skyros. 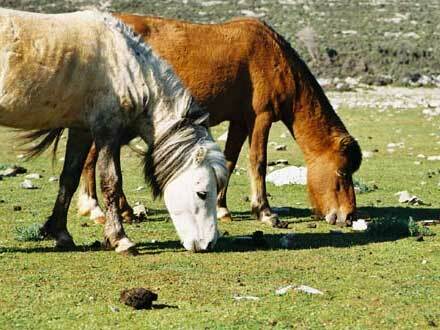 The Skyros Ponies, with a height of one meter, is a rare breed of horses of ancient Greece. There are various theories about their origin. They resemble, however, much to the horses in the frieze of the Parthenon. 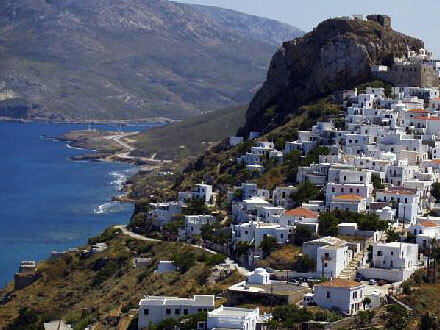 In the 5th century BC, Skyros was under the sovereignty of Athens. The Skyros Ponies is a protected species. An association has been established and takes care of their preservation and development. Of the 220 living currently in Greece, 120 live in Skyros and the rest in the island of Corfu and the farm of the University of Thessaloniki. The Mountain region in southern Skyros is their natural habitat where they live free. They also live in private farms, where the kids can ride.